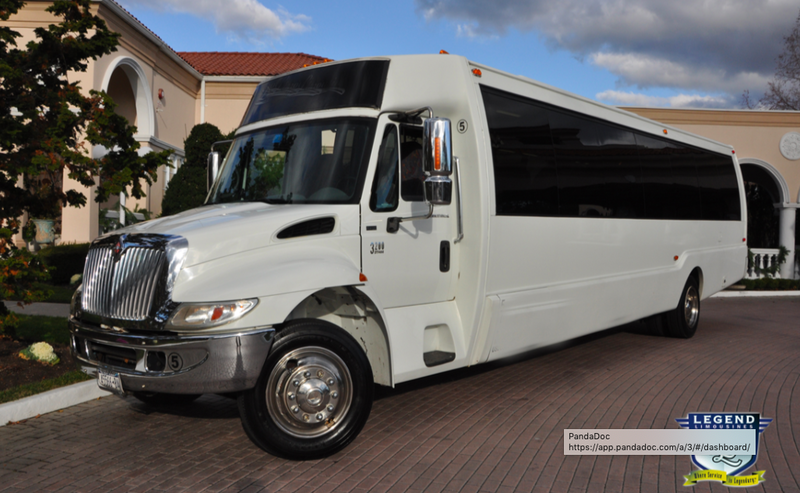 Does your special occasion require that you move 21 – 28 people? This bus is the perfect solution! Comfortable for up to 25 passengers, this bus has 10-foot ceilings, providing for plenty of head and walking room. There is very comfortable seating surrounding the entire interior. Another unique option is the working bathroom featuring a wash sink. Winery tours or long excursions are no problem with this bus! On the back wall, there is a 40” flat screen television, and on the front partition, there is a 20” flat screen television. The high power stereo system features 2-12” sub-woofers and 8 speakers, ensuring quality surround sound for your favorite movie on DVD or your favorite album on CD. The bars and counters are made of dark granite, and there is fiber optic lighting running through the bar, seats, and stainless steel ceiling. Completing the entertainment package is a mobile satellite system, allowing your guests to no miss any part of that important game.